ATA specialise in high-rise painting or rope access painting of buildings of any height. Our rope access tradesmen will accomplish in hours work that previously took days to complete using scaffolding, cherry pickers or scissor lifts. And typically, this is at a much reduced cost, with far better safety and less headaches for all concerned. High-rise buildings such as the Woolworths Building in Sydney CBD are an example of ATA’s high-rise painting service. Prior high pressure cleaning by ATA was also included in the painting of this Sydney Landmark. Call or submit an online enquiry now for an obligation free quote. 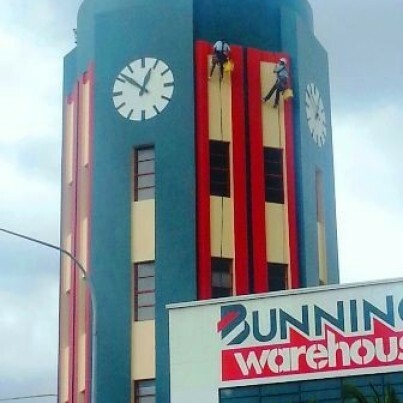 Bunnings Clock Tower, Burwood, Sydney. Painting and Repairs.